Start your day off right with these healthy protein pancakes. One of my favorite things to do on the weekend is cook a delish breakfast. I love making pancakes from scratch and experimenting with different ingredients to make yummy, nutritious pancakes. Problem is, most pancakes are highBreakfast usually consists of high carbohydrate foods and lack in protein, so I am always trying different recipes to bring more balance to my breakfast while still enjoying a tasty meal. 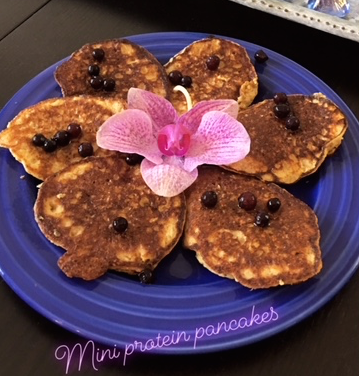 Today I made these mini protein pancakes. I wanted the protein to come from whole, nutrient-dense foods and these did not disappoint. These pancakes work best as “mini” pancakes. They do not hold up as well once you make them larger. This article is from Hannah Padgett, RD, CSP, LD , a public health dietitian and CrossFit coach from Key Largo, FL. Nice and informative blog about pancakes. This pancake recipe looks so yummy I will try it. Cooking is my favorite pass time on weekends and on every weekend I try something new. This time I going to try your healthy protein pancakes recipe. Looks like a delicious recipe, can’t wait to try at my house. Wow! It looks very beautiful and delicious. Nice and informative blog about pancakes. Thanks for share this recipe. I love this recipe. Thanks……Keep sharing this type blog. Healthy protein pancakes look a perfect breakfast. I will surely try this tasty breakfast tomorrow morning. Thanks for the post. Very good explanation. It looks very beautiful and delicious. Nice and informative blog about pancakes. Thanks for share this recipe. I love this recipe. Thanks……Keep sharing this type blog.